* This time is different? Money flow into the SPY index ETF has notably dwindled during 2015 after having tracked price pretty well for most of 2014. 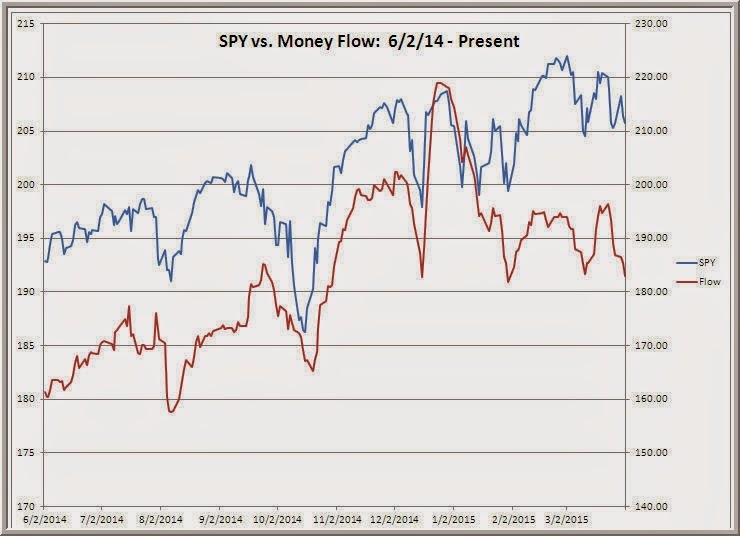 Money flow reflects price times the number of ETF shares outstanding. My figures show significant flow differences from sector to sector. I will be posting those numbers this week. In general I've found money flows to be a good (contrary) sentiment measure that is independent of options-related sentiment indicators. * Thanks to a savvy trader for pointing out this portable biofeedback unit measuring brain waves. The idea is to directly measure brain activity related to concentration/focus, stress, relaxation, etc. What's unusual about the unit is that it allows measurement even when the wearer is moving around. I'll look into this further, particularly for validation studies that show a high correlation between the readings of the portable unit and those of standard EEG machines. * Here's another new tool on the market that looks quite interesting: The Edgewonk electronic journal is integrated into Excel and integrates your trading observations (mood/psychology; thoughts about markets) with your P/L. The journal also tracks performance metrics, so that you can see where your trading has been strongest and weakest. Over time, this could form a great database for learning and performance improvement. * Podcasts have been gaining in popularity, and a number of worthwhile sites are out there. Abnormal Returns curates excellent podcasts each week, including the recent selection that includes discussions on creativity and technical analysis. A wide ranging collection of podcasts related to positive psychology can be found here. * Here is the collection of Forbes blog posts related to positive psychology, with a particularly look at the factors that contribute to success in performance-related fields such as trading. Why Do Disciplined Traders Make Bad Decisions?